You’d think that after the outrage following the Corkman Inn’ s demolition, no one would dare demolish another gold rush era pub, but sadly another one might be set for the wreckers ball, only this time with the legal approval of the City of Melbourne. The Great Western (originally Star of the West) Hotel has stood on King street since 1864, but if developers have their way it will soon be rubble under the site of an all glass apartment tower applied for earlier this month. Despite being ‘c’ graded in previous heritage studies, like many historic buildings in the CBD it has never received formal protection. 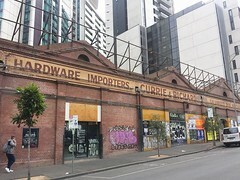 We are calling on the City of Melbourne to urgently list this early reminder of Melbourne’s history before it’s too late, in anticipation of the upcoming Hoddle Grid Heritage review which will surely find it of much greater significance that it’s current status would suggest. Following on the loss of the Stork Hotel a few years ago and the recent approval of full demolition of the Duke of Kent Hotel, as well as rumours on the fate of the Metropolitan Hotel on William Street, heritage pubs are becoming an endangered species in the CBD, robbing the city of exactly the kind of social life and mixed use that makes apartment living in the city so desirable. In July 2017, Council approved a modified tower proposal that retained the two street facades of the hotel, which also opened up the ground level. MHA’s response is that this is the worst kind of facadism, and suggested that at the very least the ground level should be restored rather than opened up; are told that it may be further modified, but no further information as of September. 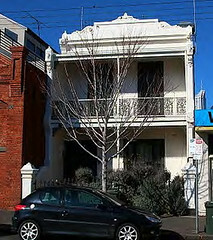 Act now to save our heritage buildings which form the fabric of our history. This would never happen in Rome or Paris! Why do we value our historic architecture less? We hope youve sent your thoughts to the City of Melbourne and the Lord Mayor ! To me, the GW is more holy than St Patrick’s; more revered than the State Library; more hallowed than the ‘G’. Have sent letters to both Robert Doyle and Planning. Enough already. Greedy councils. Leave our beautiful city as it is. This is the heritage and charm we are famous for!!! !